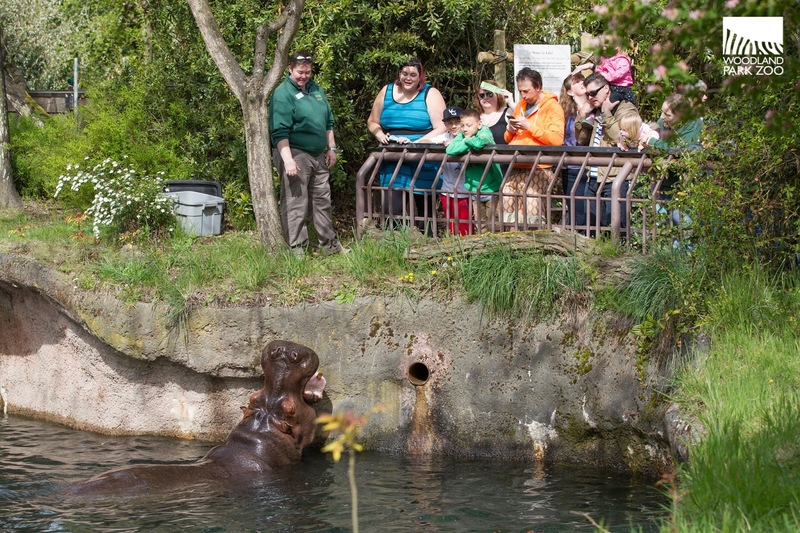 Come to the zoo this Saturday, April 14 for Spring Safari! 2. Meet K9 Officer Benny! 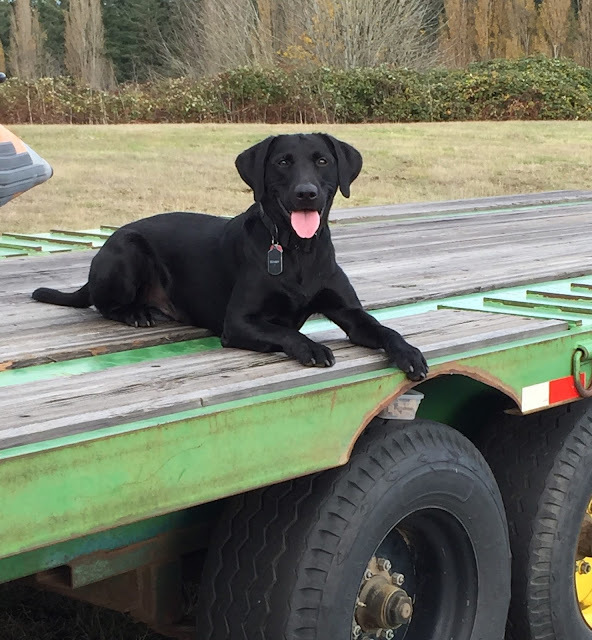 Washington State Department of Fish and Wildlife’s (WDFW) first wildlife detection dog will be here with his handler Detective Lauren Wendt. They’ll show us how Benny uses his sensitive sniffer to protect wildlife and find illegally trafficked wildlife items. Visit the WDFW Tip Trailer on the zoo’s North Meadow to learn more about items that are illegally trafficked here in Washington state and about global trafficking concerns. 3. Take conservation action to save gorillas. Bring your used handheld electronics to our ECO-CELL receptacles for responsible recycling and keep them out of landfills. Coltan, a mineral used to prolong battery life in handheld electronics, is mined in precisely the same place gorillas live in Africa. By responsibly removing the coltan from old devices, we can cut back on mining and save gorilla habitat. 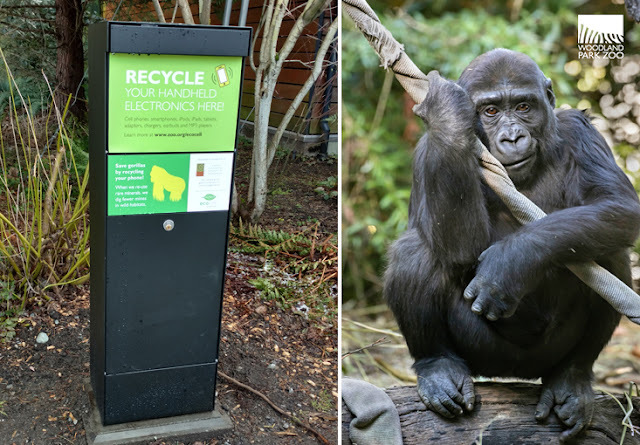 Learn more about this and about our gorillas, including Yola, at our 11:00 keeper talk. Electronic drop boxes for your used devices are located at the west and south entrances. Ready to hunt for camera traps! Photo by Jeremy Dwyer-Lindgren, Woodland Park Zoo. 4. Become a Wildlife Ranger. 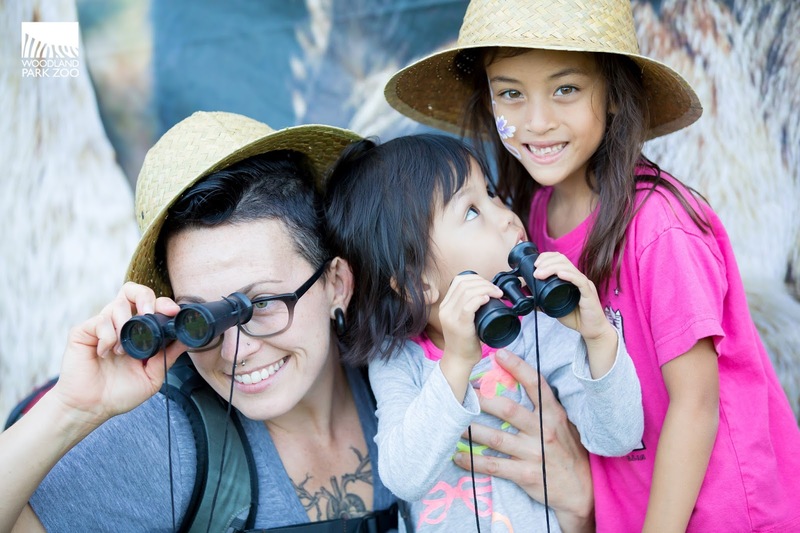 Before starting your scavenger hunt to look for camera traps, visit our table to learn how to “Pack Like a Ranger.” You’ll want to make sure your pack is full for the day before heading out to retrieve that camera trap data. Once you’re done, you can do citizen science research by helping to identify animals in photos taken with real camera traps in East Africa. If you’re more the photo safari type then the researcher type, visit our table on Safe Souvenir Shopping, to learn the right items to purchase when traveling abroad that will allow you to remember your trip for a lifetime while protecting Africa’s natural resources. 5. Spring cleaning inspired crafts! 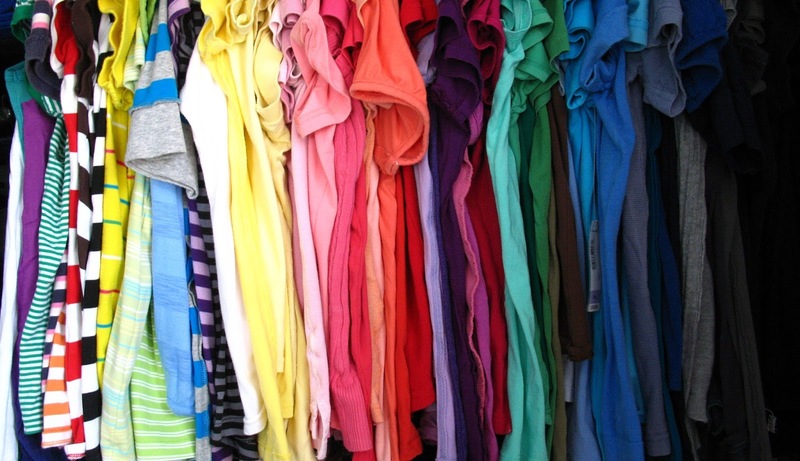 Finally, clean out those closets and bring your old t-shirts to the zoo. Our ZooCorps teens will work with you to convert those shirts into useful items you can take back home like tote bags, dog toys and stuffed animals! If you’ve already completed your spring cleaning (and congratulations if you have), don’t miss our origami cacti making and natural dyes demonstration to learn about the environmental and cultural importance of native plants. 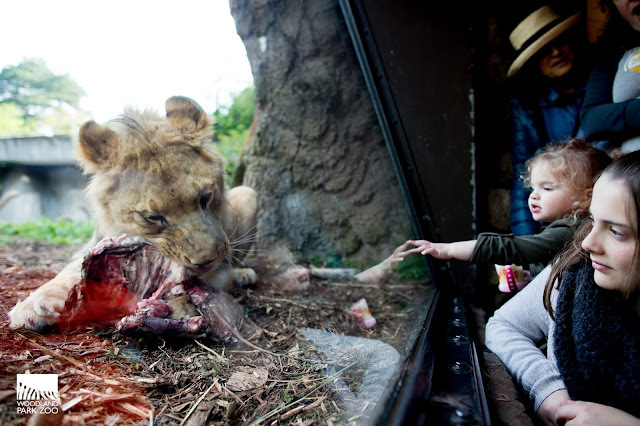 A lion mows down on a meaty snack as curious visitors look on. Photo by Jeremy Dwyer-Lindgren, Woodland Park Zoo. 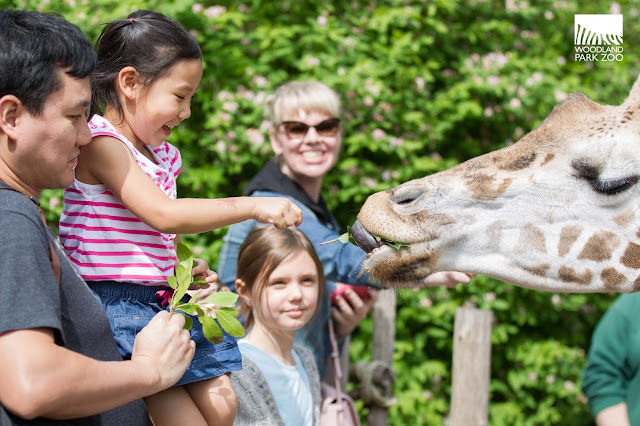 Spring Safari will take place on Saturday April 14th from 9:30 a.m.–3:00 p.m. and most activities are free with zoo admission. Locations and times will be posted at the zoo entrances, or you can download the Woodland Park Zoo mobile app for specific activity times and locations. Hippo snacks! Photo by Jeremy Dwyer-Lindgren, Woodland Park Zoo.